Garamba is exceptional as it not only provides spectacular savannah scenery with its associated wildlife, but also boasts extensive sections of forest that house forest specialists. This variety of habitats has resulted in an exceptionally high biodiversity. Garamba is situated in the district of Haut-Uélé in the north eastern corner of the Democratic Republic of the Congo, adjacent to the Sudanese border. Garamba adjoins Sudan’s Lantoto National Park and is surrounded in the south, east and west by the Gangala-naBodio, Mondo Missa and Azande domains de chasse or hunting areas. The park’s northern border is the watershed of the Nile and Congo Rivers. The total area of the Garamba complex is 12,427km2. Garamba National Park was established by Belgian Royal Decree in 1938 and became one of the first national parks in Africa. It was closely linked to the Elephant Domestication Centre, established in 1920 at GangalanaBodio, where more than 100 elephants were trained to work in agricultural fields. Garamba was proclaimed a UNESCO World Heritage Site in 1980. It was listed on the World Heritage in Danger list in 1996 due to the threat to the remaining northern white rhino, which is now thought to be extinct at Garamba. The southern part of the park is predominantly grassland savanna with scattered trees. Loudetia and Hyparrhenia grasslands are not uncommon with sausage trees (Kigeliaafricana) and Vitexdonniana occurring. Further north the vegetation is mainly mixed woodland, with dense dry forests and riverine and small swamp forest including species such as Chlorophoraexcesa, Khayasp and Irvingiasmithii. In contrast, the hunting areas are predominantly dense bush savanna, mixed deciduous woodland and forests. 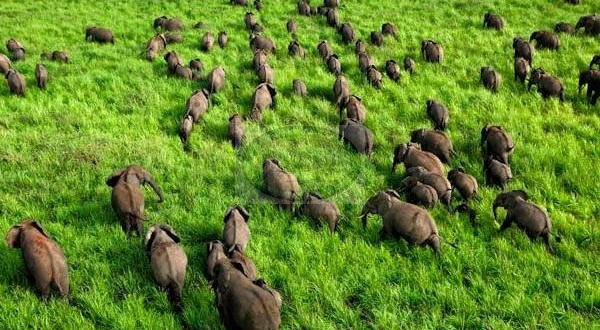 Garamba provides excellent habitat for elephant as it offers abundant food and water resources. The elephant found here are believed to be a hybrid between the savannah species (Loxodontaafricana) and the forest elephant (Loxodontacyclotis). Elephant numbers at present are estimated at around 3,500. Garamba is also home to the Congo giraffe (Giraffacamelopardaliscottoni or congoensis) of which approximately 70 are thought to be roaming in the park.It is arguably most famous as the last refuge for the northern white rhino (Ceratotheriumsimumcottoni), however there has not been a sighting in the park since 2007. Many other species remain in Garamba and its surrounding hunting areas. Large antelope species one might expect to find include bushbuck (Tragelaphusscriptus), waterbuck (Kobus ellipsiprymnus), oribi (Ourebiaourebi), Uganda kob (Kobus kobthomasi), Lelwel’s hartebeest (Alcelaphusbuselaphuslelwel) and roan antelope (Hippotragusequinus). The secretive bongo antelope (Tragelaphuseurycerus) also occurs in Garamba although it is not regularly seen. Several smaller antelope species grace Garamba, including several species of duiker, notably blue duiker (Philantombamonticola), red-flanked duiker (Cephalophusrufilatus) and yellow backed duiker (C. silvicultor). Other species such as the red-river hog (Potamochoerusporcus), warthog (Phacochoerusafricanus), hippopotamus (Hippopothamusamphibius) and Nile buffalo (Synceruscaffer) are also not uncommon. Several primates occur in Garamba National Park, including the Guerezacolobus (Colobusguereza), Patas monkey (Erythrocebuspatas), vervet monkey (Chlorocebuspygerythrus), the De Brazza’s monkey (Cercopithecusneglectus) and the chimpanzee (Pan troglodytes). The predators that roam Garamba are notably spotted hyaena (Crocutacrocuta), leopard (Pantherapardus), lion (Pantheraleo), serval (Leptailurusserval) and several smaller predators. Bird diversity is also high with more than 340 species recorded in the park. Spectacular colonies of carmine bee-eaters (Meropsnubicus) are common along the banks of the River Dungu and clouds of cattle egret (Bubulcus ibis) can be seen circling over the large herds of buffalo. With Green Hills EcoTours Tourists will discover this an unspoiled part of Africa and experience the adventure of a Lifetime. Encounter with wildlife and interact with local people while contributing to the sustainable ecotourism.